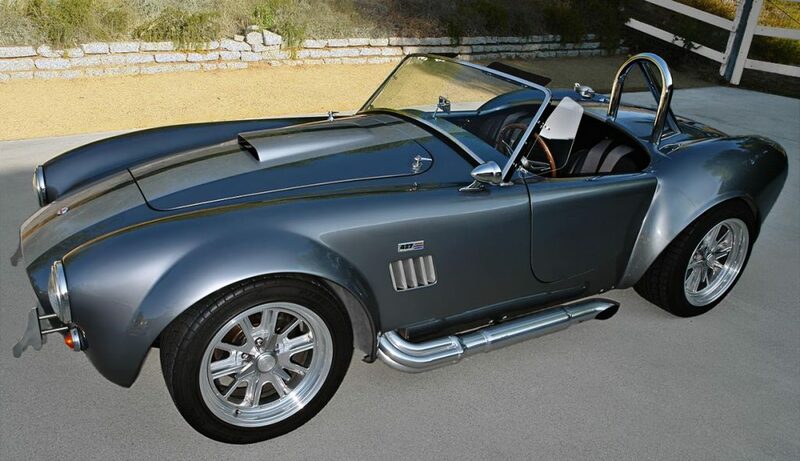 This is a multiple award-winning Factory Five Racing Cobra Roadster. 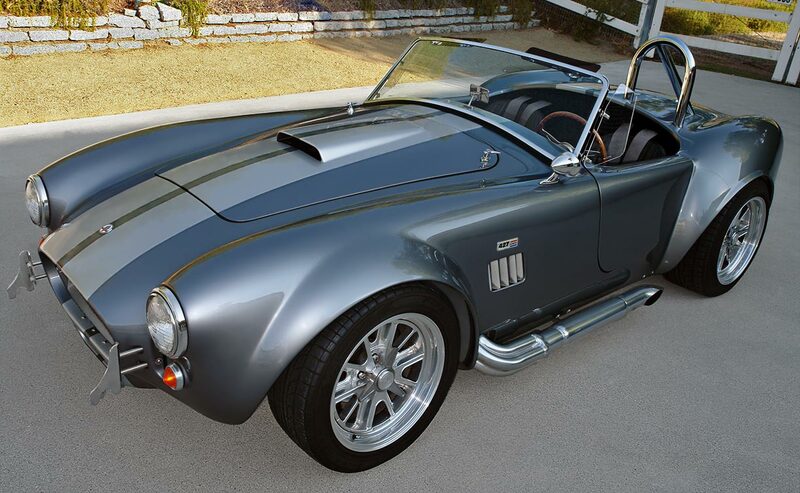 PPG Silver two-stage paint with light silver stripes finished with 11 coats of clear. Very rare 427FE side-oiler engine. 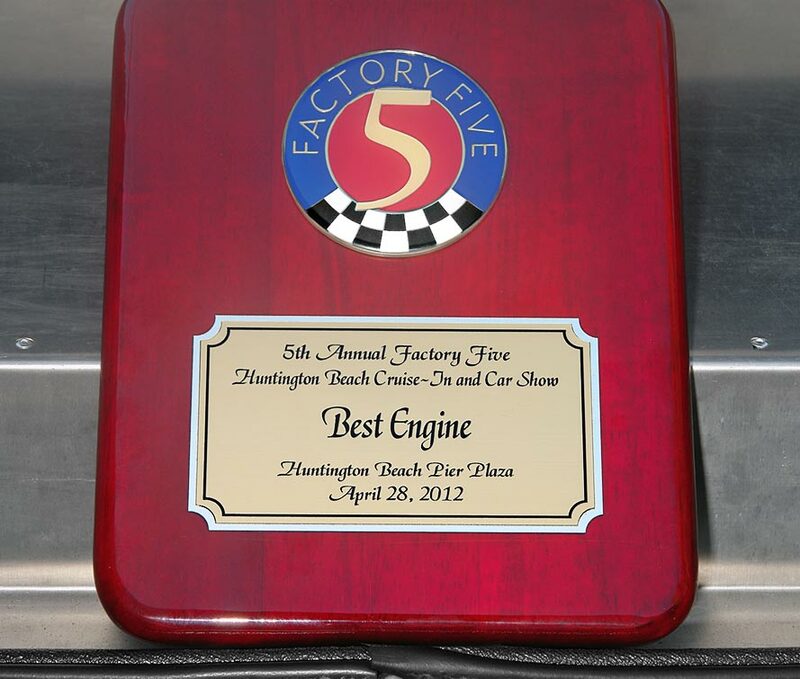 Professionally constructed by renowned Factory Five builder Scott Martin. It’s registered in California as a 1965 FFR with absolutely no smog requirements at all. 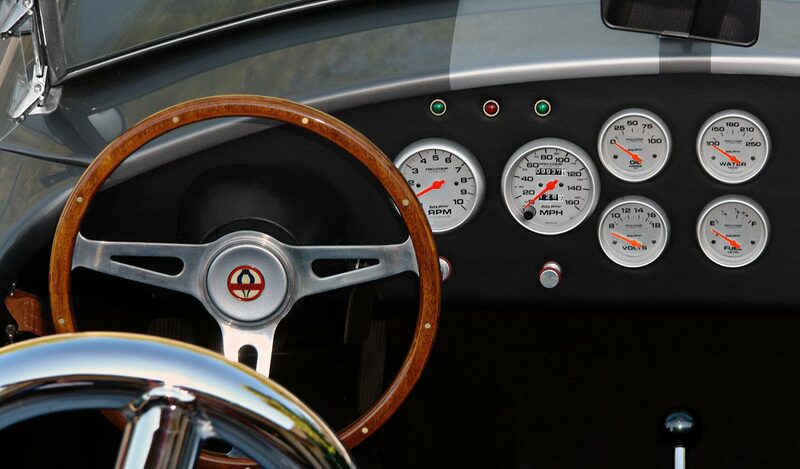 Driving this serpent is as authentic as it gets to driving an original. Original-correct and easily serviceable Ford 427FE side-oiler. 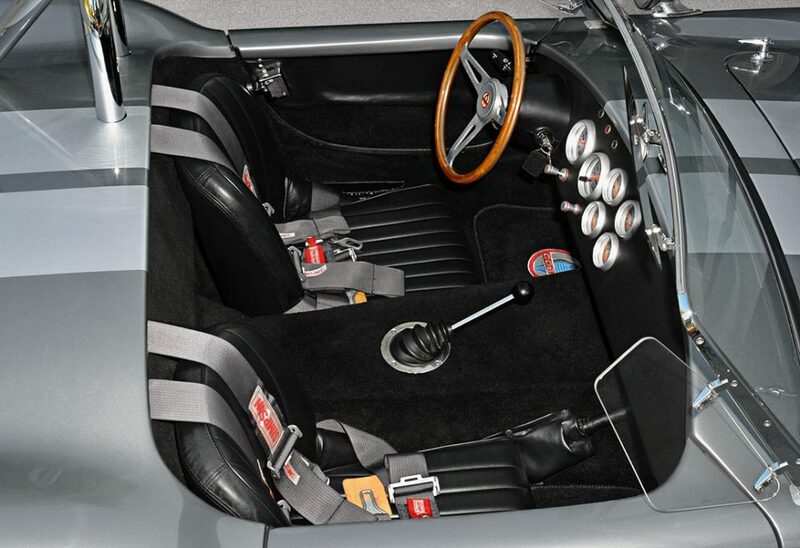 The 427FE side-oiler was completely redesigned, by Ford… a 427cid (7.0 L) cross-bolted (for extra block rigidity) engine block that first debuted in 1965 to replace the center-oiler (aka ‘top-oiler’) block. It was purposed primarily for NASCAR oval-track racing. The block is special-alloy cast iron with a specially thickened deck to withstand higher compression. The side-oiler track delivers oil to the crankshaft first and to the cam and valve train second. The side-oiler’s telltale evidence is the bulging oil gallery just above the oil pan on the driver’s side of the engine block. 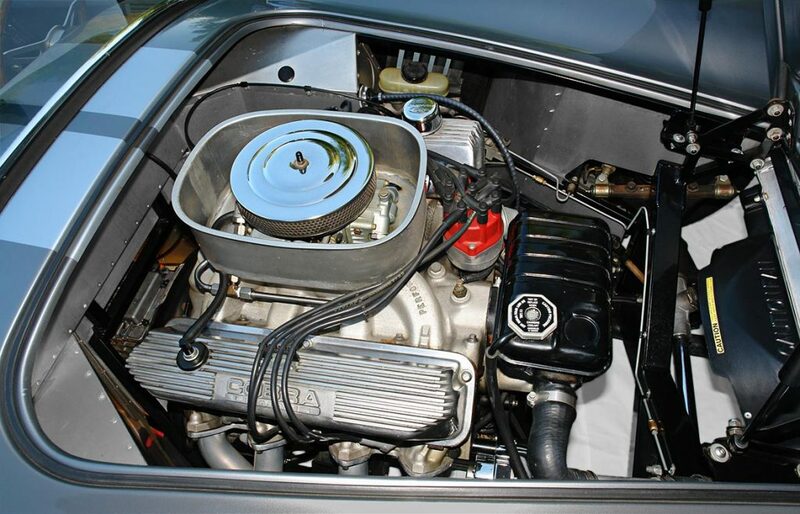 Absolutely cleanest engine compartment you’ll encounter. Outfitted by famous Barry White, Ridler Award–winner of Barry White’s Street Rods. 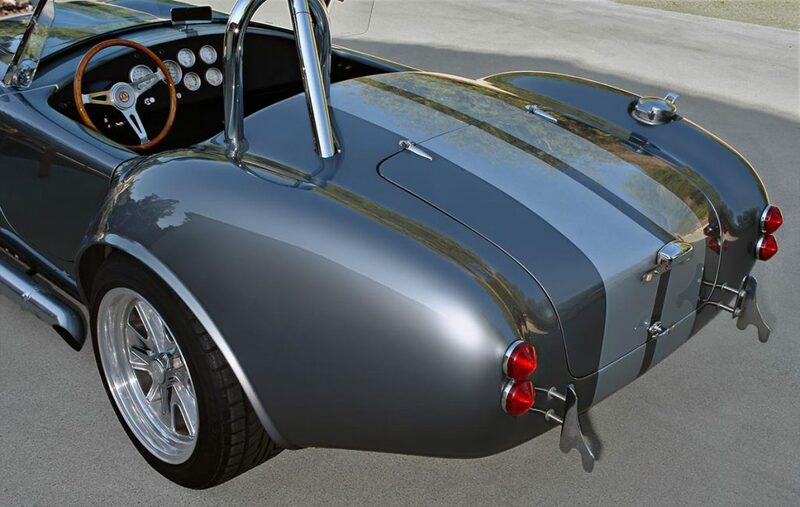 Here (above) is something you don’t get to see very often: an undercar (driver side) shot of this Cobra’s Ford 427FE “sideoiler bulge” [actually, this photo captured only about 2/3 of the S/O bulge… there’s yet another hex plug to the right, at the input end of the 4th oil channel. Curiously, at the back end (not shown here), the bulge widens and flattens out for the last couple of inches. Those four horizontal internal channels feed oil from the “bulge” directly to each main bearing—and at even pressure and volume to each of those critical bearings. Here it’s magenta-tinted so you can clearly see its profile. 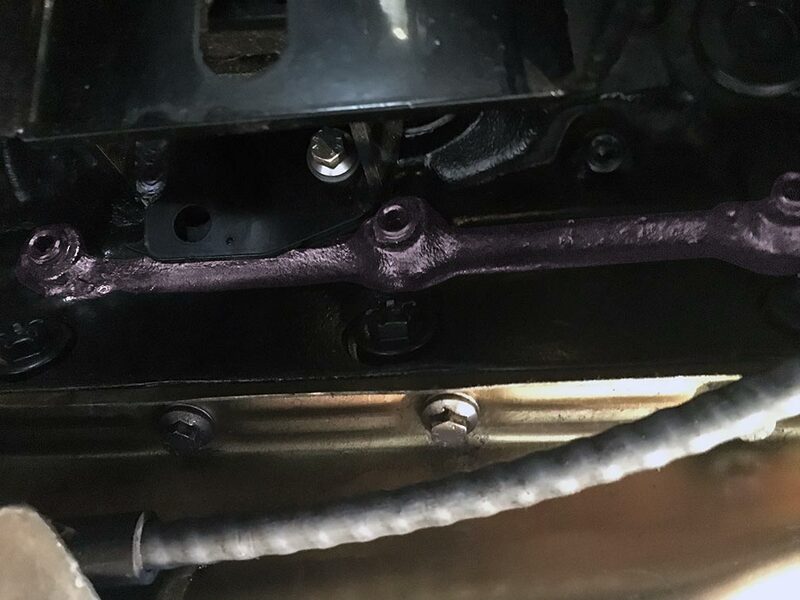 That molded-in (to the block) sideoiler track was a signal improvement in the 427FE’s oiling and overall performance on NASCAR oval tracks back in the mid/late 1960s. With the earlier center-oiler 427FEs, the oil was forced to run a circuitous route to finally reach those critical main bearings, thus reducing the oiling effectiveness. Other than bragging rights, a sideoiler 427 today provides no performance advantage over a center-oiler (aka “top-oiler”) 427. They’re both quite rock-solid performers. 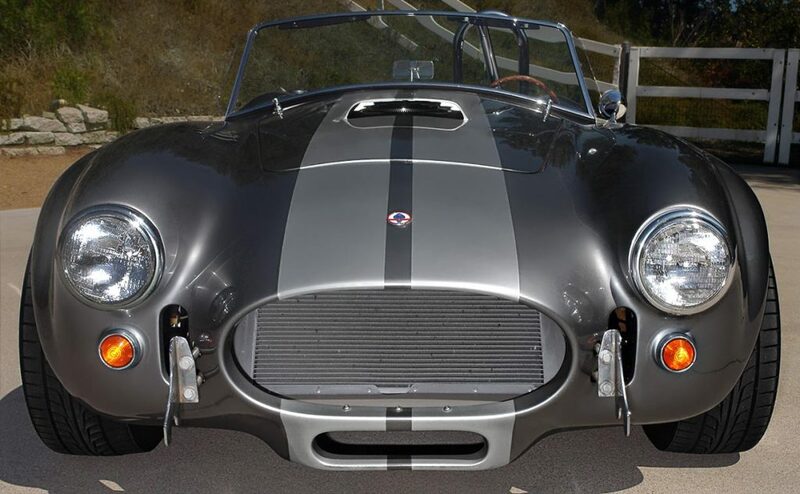 This car embodies the power and performance that made American muscle cars the icons of yesteryear’s motoring world, with a timeless elegance and sleek sophistication. If you want to set off all car alarms in a parking lot, this is the drivin’ machine to do the job!